This handsome guy lives for the show ring! We are very pleased to announce Solo flew to his American championship in June, 2012 under the expert guidance of his friend Shannalee Waller-Michalsky. Solo finished with 3 Specialty Majors to his credit!! Solo was No. 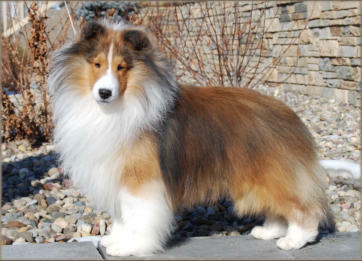 1 Male Sheltie in Canada in 2010. Solo congratulates champion kids; Multi BPIS, BPISS, Ch. Westpointe’s Guilty Pleasure “Sindee”, BPIG Ch. Coastwynn Counterpoint, “Sam”, BPIG Ch. Westpointe’s Affinity “Kenzie”, Ch. Westpointe’s Tribecca, and Ch. Dalgarnoch Opening Act “Danny”. Solo is enjoying life as a resident retiree at Westpointe!